Hamm, the piggy bank in Toy Story, is a criminal mastermind. You all remember the part where he uses Etch, the Etch-A-Sketch, to formulate a plan to rescue Woody, right? Well, now iPhone owners can formulate, sketch and erase notes, reminders, evil plans and doodles to their hearts content with the iFoolish magic drawing case. All whilst resting assured that it be completely erased in a matter of seconds. 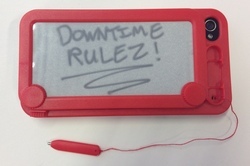 App versions of Etch-A-Sketch are readily available but they’ll never be as much fun as having to slide the eraser backward and forward yourself. Downtime believes dexterity is very important. If you want to relive the good ol’ days and do your best Neil Buchanan impersonation you can pick a case up from Mobile Fun.